For his final undergraduate project, Lucas turned his attention back to his love of cars, the same love which had landed him in a ditch and almost ended his life; the very reason he was at USC to begin with. Lucas (circa 22 years old) on location at Willow Springs Raceway filming 1:42.08. Notice camera operator Emmett Alston strapped to the side of the other car. Although the the title card shows only the numbers, it is also sometimes referred to as “1:42.08 to Qualify” (the name on the script) and “1:42.08: A Man and His Car” (unclear where this titles came from). It’s a frantic little film portraying the driver, renowned race car driver Peter Brock, of a sleek yellow racing car—a borrowed 1100cc G Modified Lotus 23—running laps on a course in an attempt to qualify for a race. Knowing Alan Grant from Shelby American, George asked for a recommendation for a driver for his film. Grant recommended Peter Brock, who had been a consultant and driver for the movie industry (e.g. stunt driver in the ‘64 movie The Killers) and had left Shelby American just months before to open his own company, Brock Racing Enterprises (BRE). Brock says the most memorable part of the experience were the evenings where they hung out and Lucas shared his vision for a series of sci-fi movies. “It sounded kind of like Buck Rogers with strange creatures and better weapons. Very strange and we just kind of nodded and patronized this enthusiastic kid.” says Brock. (The latter part of this story may be true, but if so Lucas was probably referring not to Star Wars, but to THX 1138 although even that sounds like a stretch given the timing). 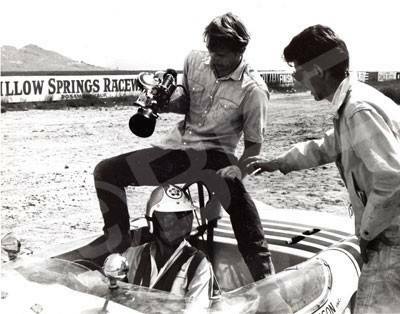 Lucas (right) directing Peter Brock (driver), with camera operator, Emmett Alston (center), mounted on the roll bar for the following shot. Opening at sunrise on a crew prepping the car prior to the run, it’s brimming right out of the gate with the kinds of touches that define Lucas’s early work. And though he had started blending his love of cars with his love of cinema in Herbie, this was an all-out love letter. Not only is it shot in 16mm color—unheard of for a student film in those days, not to mention very costly—it was also shot entirely on location, which is to say off-campus at Willow Springs Raceway, north of Los Angeles. Which despite Lucas excused himself out of by pointing out that ‘everyone did it’, was against student regulations which strictly forbid leaving the university grounds. To top it off, the film even had an aerial shot in it, courtesy of a plane allegedly borrowed from a friend! Whether fueled by his early success on the film student circuits and building reputation as a savant, or simply by the general air of 60s rebellion, Lucas had already adopted a disregard for rules and regulations. As one in a series of his tone poem-like shorts, written, directed and edited by Lucas himself, backed by a small, efficient 14-person student film crew, it oozes Lucas’s love of editing, and camera work. The kind of cinéma vérité and cinéma pur streaming out of Europe and Canada. In fact, one of Lucas’s inspirations for the film was Jean-Claude Labrecque, a documentarian and cameraman who had come from NFB, and whose film 60 Cycles functioned as a framework of sorts for 1:42.08. It too was about a race, but as the title implies, one of bicycles (in Gaspé, Quebec to be specific). It was exactly the kind of film Lucas loved. He borrowed it from the library and watched it over and over[p11, 1]. Where Arthur Lipsett’s montage films had bolstered his love of Eisenstein and irrevocably sent him down the editor track, 60 Cycles informed his use of the camera in almost as influential a manner. To Lucas it must have been a revelation. He would go on to make wide use of long lenses, from this, his first serious attempt at a cohesive piece of film, up through all of his films. The lineage from 60 cycles through 1:42.08 to THX 1138, all of which share the use of extreme long shots held for in place for extended periods of time is particularly clear. It’s a technique also widely used by several of Lucas’s other favorite filmmakers, the likes of David Lean, John Ford, Sergio Leone and of course Akira Kurosawa. Where wide lenses emphasize the distance between things, long lenses compress distances, in effect flattening the image. The result can be one of otherworldly elegance, as in the case of 1:42.08 and Lucas’s subsequent re-use of the technique in both his student and documentary work. It’s most notably perhaps in THX 1138, where it almost removes the sense of ferocious speed from the climactic tunnel chase. Despite barreling down the track towards the camera, like the cars and bicycles in the opening shot of 60 Cycles, the racing car and motorcycles are reduced to a slow swerve back and forth. The subjects of a an extreme long lens shot, be they cars, bicycles, horses or camels are nearly reduced from three-dimensional objects to shapes; a ballet of shapes in unnatural movement. In 1:42.08 it mostly has a rhythmic effect, acting as a counterpoint to the frantic intercutting of gear shifting, instrumentations and closeups of the driver (all shots reused verbatim in THX 1138 and transposed into the X-Wings of Star Wars). In THX 1138 the same long shots manage to both make THX’s escape attempt feel almost impotent, as his supercar at first seems caught, unable to move; as well as imbue the pursuing robot police with a relentless sense of purpose, as their motorcycles glide inhumanely across the screen. And just to hammer the point home, both sequences make use of the low POV shot of the road roaring underneath the car. And both THX and the driver of the yellow Lotus spin out at a critical moment, only to reengage in the race/chase. But the final lesson, one that ended up defining much of the New Hollywood approach to filmmaking, was one of efficiency. Even though the crew of fourteen on 1:42.08 was large by USC standards, Lucas had the chance to see the production of Grand Prix, a big-scale Hollywood production fielding a 120-man crew, where as Dale Pollock notes in Skywalking, “The studio cast and crew retired to portable dressing trailers at the end of a day’s shooting, while Lucas and company headed for their portable sleeping bags.”[kl892, 3]skywalkingkindle. Lucas would run into a similar thing on the set of McKenna’s Gold soon after when he was filming another tone poem, 6–18–67, cementing his belief in old Hollywood as an irreparable engine of waste. Ultimately 1:42.08 didn’t have the impact of some of Lucas’s earlier films, although it did reinforce the young director’s belief in the power of cinéma pur and in working outside of the system, not to mention being a dry-run for the climactic third act of THX 1138. Jim Smith, George Lucas. Virgin Media, 2003. Jean-Claude Labrecque on Wikipedia, accessed on Sep. 28, 2012.